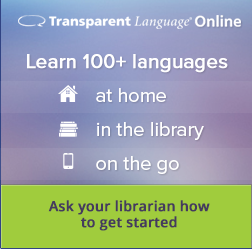 Learn a language with Transparent Language! All Adams County Library patrons can learn a language on their pcs, tablets, or mobile devices with Transparent Language. Click here to create your account. You'll need your library card number. Don't have one? Give us a call to get started.